Charleston, SC is known for many things and one of the more surprising aspects of the city is how great the fishing is. Located next to multiple river mouths with plenty of tidal estuaries, it’s a veritable saltwater fishing paradise. Blessed with mild winters and hot summers, multiple species migrate through our waters. Most famous, and probably the most fun to catch are Redfish. 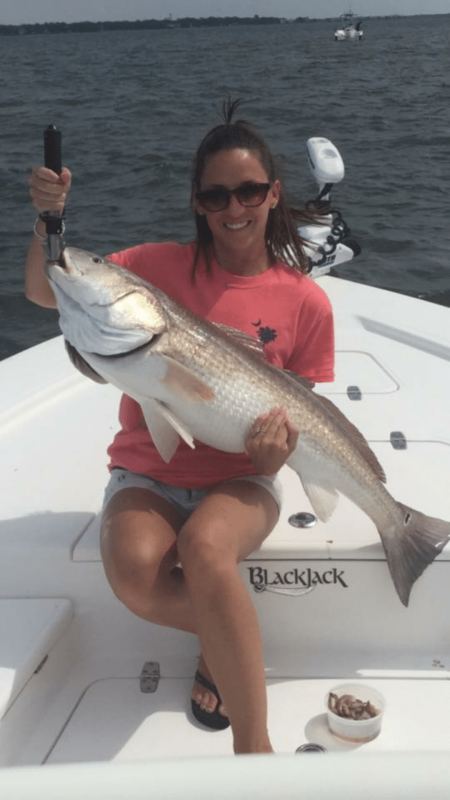 How Big do Redfish Get? Commonly referred to as Red Drum, the fish can get big. Every year, anglers land giants, weighing upwards of 30lbs. While it’s possible to hook into a big fish, the average size is between 15-24 inches. Their abundance and average size make Redfish excellent game fish. They are aggressive and fight hard. A 3-10lb weight range makes fishing with lighter tackle possible. Fisherman can use intuitive spinning reels and medium/heavy action rods. The relative size of the rod and reel make casting easy and fun. Another sporting quality of the fish has to do with the waters they call home. Lucky for us, they enjoy the relatively placid inshore waters off the coast. To target them, we commonly use the Blackjack 224, which is fast and comfortable. The sport-fishing aspect of the fish means fisherman will spend most of the time casting, and catching redfish. Redfish move throughout the year from shallow mudflats to deeper water in the harbor. When they are found in shallow water, sight fishing is possible. Redfish that hang near the surface of the water column. They are lurking, waiting for food to come their way. When redfish are feeding on crabs and other crustaceans, their tails will stick out of the water. A well-placed cast generally manifests a nice fish. When Redfish are hanging in the deep water, floats are a common strategy. With the proper depth, live bait can elicit strikes from some large fish. With so much fishing opportunity in Charleston, there is hardly ever a bad season for Redfish. Knowing the tides allows you to get where the fish are. When the fish are stacked in shallower water, getting back into the grasses is where the action is. Using a charter service will maximize your time on the water without needing to struggle with timetables and seasonality changes. Whether you live in the Charleston area or just visiting, an experienced guide will put you on the action. What Other Kind of Fish Call Charleston, SC Home? While we are proud of our Redfish, there are a variety of species which keeps the fishing interesting. Especially popular with first-timers, this fish is abundant and fun to catch. Averaging about 20 inches in length, hooking into one of these is no joke. With so many species in the water, you just never know what you might catch. Some of the bigger sharks can take nearly an hour to land – all you need is one. If you’re looking for a successful fishing trip in Charleston, SC, look no further than RedFin Charters. With experienced captains, we’ll put you on the fish.